Grindelwald pictures. 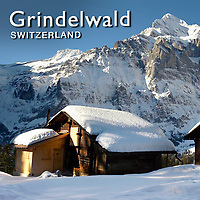 Photos & images of the Grindelwald Swiss Alps. Grindelwald travel pictures & images to buy as stock or prints. Grindelwald has been long famed as a winter tourist destination with slopes for beginners, intermediates and the challenges of the Eiger glacier for the experienced, there are activities for the non-skiers, from tobogganing to groomed winter hiking tracks. It is the usual starting point for ascents of the Eiger and the Wetterhorn. Nowadays Grindelwald is also a popular summer activity resort with many miles of hiking trails across the Alpine meadows full of Alpine flowers.